Vacations are an amazing way to get away from it all — to refresh, recharge, explore — or whatever your little heart desires. While packing up and heading out of town can be tons of fun, you of course have to eat. While it’s super-easy to pop into whatever restaurant you can find while you’re on the go, it may not be the healthiest choice. We spoke with nutrition experts to find out how you can avoid eating like garbage while on vacay. 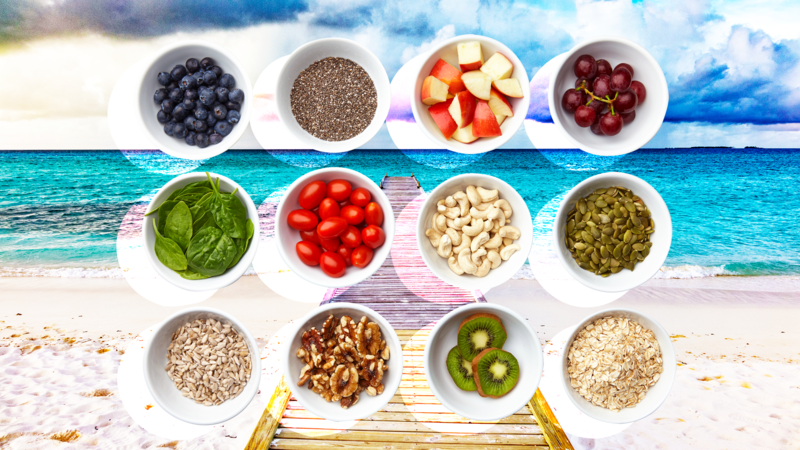 While eating healthful foods on vacation is a good goal to have, try not to stress over every single calorie or gram while you’re away, Sunny Brigham, a board-certified clinical and integrative nutritionist, tells SheKnows. “I usually tell people that being on vacation is a great time to relax, de-stress and get the body functioning how it was meant to function,” she says. Having said that, there are a few ways you can avoid consuming tons of crap (which, let’s face it, is pretty easy to do when you’re too busy or unable to cook). Another strategy is to virtually scan what’s available near where you’re staying and plan ahead. Registered dietitian Denine Cimmons Stracker tells SheKnows people may want to consider placing a small online grocery order at a nearby grocery and having it delivered to your hotel room on the day you arrive. This will keep you on the right path nutrition-wise and won’t lead to food purchases later that are more costly, devoid of real nutrition and that you’ll likely regret. “I recommend buying a few staple foods like fresh fruit, unsalted nuts, canned tuna, whole-wheat bread, apricots, raisins or yogurt,” Cimmons Stracker explains. “These can power up your morning before stepping out the door or fill the gaps between meals during long days of sightseeing.” Hotel rooms that have an in-room fridge are an added bonus, which can make it easier to stay healthy. With a smartphone in hand, it’s easier than ever to check out a restaurant’s menu before you step out the door, Anna Brown, an integrative nutritionist, tells SheKnows. Many restaurants have online menus, and from there you can scope out what’s offered and have a healthy game plan in place. Brown also suggests packing your own snacks (although, if you’re hoping to bring along liquids and are hopping on a plane, check out the airline rules about restrictions that might mean your snacks get tossed in the trash before you board). “I like carrots or celery with hummus, apple with peanut butter or RXBars because they have a lot of protein and no added sugar,” she says. While it’s important to eat as healthily as possible while you’re on your travels, you don’t have to completely avoid the good stuff, especially if it’s a local delicacy, Carol Thelen, a certified registered nurse practitioner at Mercy Medical Center in Baltimore, tells SheKnows. “If the location is known for a special food, such as gelato in Italy, don’t feel bad to indulge in a small treat,” she notes. In fact, it’d be almost a crime to do without. So, while it’s easier to just eat whatever you want while you’re away, it’s a better idea to keep these tips in mind and plan ahead before heading out — but don’t forget to treat yourself if you want to.